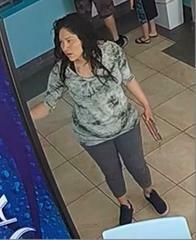 Investigators with the North Coastal Sheriff's Station want your help in identifying and locating a woman suspected of using counterfeit money at businesses in the North County. The first incident happened on April 14th at Yogurt 101 located in the 100 block of N. Highway 101 in Solana Beach. The suspect purchased $14 worth of food, paid with a counterfeit $100 bill and received $86 in change from the clerk. On April 19th, the same suspect used counterfeit money at Sun Splash located in the 2600 block of Via De La Valle in Del Mar. She bought lotion for $21, paid with a counterfeit $100 bill and received $79 in change. The suspect is also believed to have used a counterfeit $100 bill at a business in Carlsbad. Take a good look at this surveillance photo. The suspect is described as a Hispanic woman between 25 and 35-years-old. She stands between 5'4" and 5'6" tall and has long, dark wavy hair with a tattoo on the right side of her upper chest. The woman also appears to be pregnant. If you know who this woman is or have any information on these incidents, call the Crime Stoppers anonymous tip line at (888) 580-8477. Crime Stoppers is offering up to a $1,000 reward to anyone with information that leads to an arrest in this case. 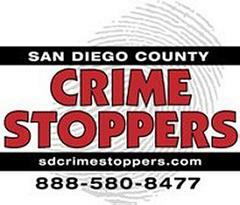 Information on how to send anonymous emails and mobile app tips can be found on our website www.sdcrimestoppers.org.